Morocco scored three goals in the first half. Nigeria’s home based Super Eagles have qualified for the semi-final of the African Nations Championship, CHAN, after a 4-3 victory over Morocco. A shambolic first half performance by the home based Eagles could have seen the team crash out of the competition being played in South Africa. However, the Coach Stephen Keshi tutored side played the game of their life to upturn a 3-0 deficit suffered in the first half. The North Africans netted three goals inside seven minutes in the first half as they led the Eagles. Moutouali got a brace for the Atlas Lions, scoring in the 33rd and 40th minute; while Lajour was on target in the 37th minute. While many felt it was all over, the Eagles through Ugona Uzochukwu began what turned out to be a memorable comeback as he scored four minutes into the second half before Rabiu Ali reduced the deficit, scoring in the 56th minute. Nigerian fans had their hearts till the 90th minute when Ejike Uzoenyi completed the comeback with a well taken strike. Incidentally the Eagles could have wrapped up the game afterwards but Barnabas Imenger’s effort was inches over the bar, a situation that saw the thrilling quarter final duel stretch into extra time of 15minutes in each of two halves. Nigeria started the better side in the extra time period but again failed to convert the early chances created. The Eagles waited till the 111th minute before Aliyu Ibrahim scored what proved to be the winner and send Nigeria into the semi final. Nigeria has now scored 12 goals in the competition so far, the highest by any team. The seven goals scored in the match is also the highest in any single match in the history of CHAN. A scanty stadium here in Capetown but the Nigeria supporters club remain the loudest of the two countries cheering their teams. Nigeria vs Morocco, 0-0 as Nigeria survives a Moroccan attack. 15 minutes played. Nigeria misses a goal mouth scramble. 0-0 against Morocco. 23 minutes played. CAF President Isa Hayatou among the few guests at the stadium. 28′ played. Morocco misses a goal opportunity as short goes wide. 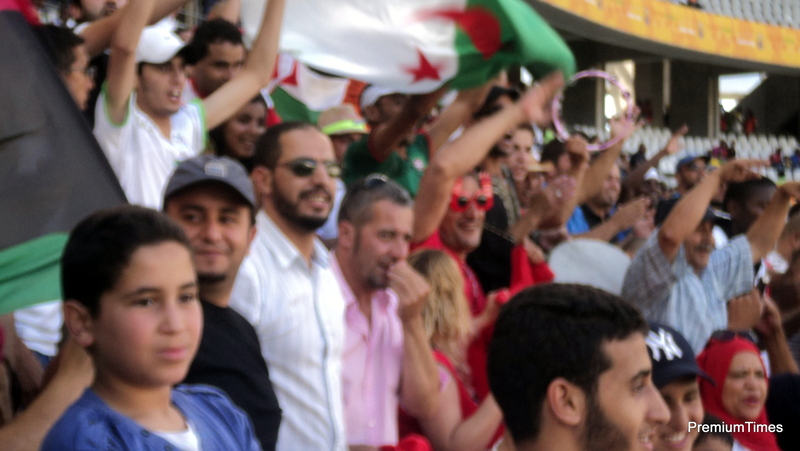 Moroccan fans bark at referee over a perceived wrong call of a push on Salami. Nigeria trails Morocco 0-1. 35 minutes played. Salami misses a goal scoring opportunity for Nigeria. Morocco scores again through a free kick. Lead Nigeria 2-0. Morocco lead Nigeria 2-0. 38 minutes played. Morocco score three goals in seven minutes to lead Nigeria 3-0. First Half ends. Morocco leads Nigeria 3-0. Nigeria had no shot on target in the first half, Morocco had three. Nigeria had 6 shots at goal, Morocco had 8. Nigeria had 45% ball possession, Morocco had 55%. Morocco scored 3 goals in 7 minutes to lead Nigeria 3-0 at end of 1st half. The winner of the match proceeds to the semi-final of the competition. Nigeria is yet to make a substitution in the game. 48 minutes played. Imenger replaces Salami for Nigeria. 52 minutes played: Nigeria trails Morocco 1-3. Nigeria scores again. Now trail Morocco 2-3. Rabiu Ali scored his 3rd goal of the competition to put score at 2-3. 58 minutes played. Nigeria trails Morocco. Abderrahim replaces Fatah Said for Morocco. Agbim makes a wonderful save to deny Morocco a fourth goal. Izuchukwu and Rabiu Ali are Nigeria’s goal scorers. Nigeria trails Morocco 2-3. 60 minutes played. Abubacar Ibrahim replaces Ifeanyin Ede for Nigeria. Karroucchy gets a yellow card for a foul on a Nigerian player. Nigeria’s Kunle Odunlami gets a yellow card for a foul on a Moroccan player. Agbim saves a well taken Moroccan free kick. Nigeria’s Rabiu Ali gets a yellow card. Brahim replaces Mohsin for Morocco. Brahim replaces Mohsin for Morocco. 78 minutes played so far. 86 minutes played. Nigeria misses a goal opportunity; trail Morocco 2-3. A Moroccan player gets a yellow card for rough tackle. Uzoenyi scores a wonderful goal to equalise for Nigeria. 3-3 against Morocco. 91 minutes played. It’s full time. Nigeria 3, Morocco 3. Match goes to extra time. 30 minutes of extra time will be played. Should there still be no winner, the match will go to penalties. While we await the commencement of extra-time, you should know that Nigeria has now scored 11 goals in CHAN2014; the highest so far in the competition. Morocco scored all her 3 goals in the first half, Nigeria scored hers in the second half. Extra time starts. Nigeria vs Morocco 3-3. Rabiu Ali misses a free header. 100 minutes played. Nigeria 3- Morocco 3. El Mobaraky replaces Rafik for Morocco. Morocco misses a goal scoring opportunity. Second Half Extra time starts. 108 minutes played: Shehu shoots wide for Nigeria. Abubakar Ibrahim scores for Nigeria 4-3. Nigeria makes her last substitution as Zango comes in. Nigeria still playing better than Morocco and look more likely to score. Nigeria leads 4-3. Three minutes injury time added. Nigeria wins. Defeats Morocco 4-3. Despite going three goals down in the first half, Nigeria defeats Morocco 4-3 after extra time. Nigeria had 33 shots at goal and 16 on target; scoring 4. Nigeria’s Ejike is Orange Man of the Match.